Last week was huge. We got a pleasant surprise visitor, Mike Cotty, from The Col Collective. He's a passionate cyclist as myself. Through a week of riding together we exchanged a lot of experience and personal stories and became good friends. But this story is about one of those many epic rides we had over that week. If you're interested in the other rides we did, you can check out my Strava. 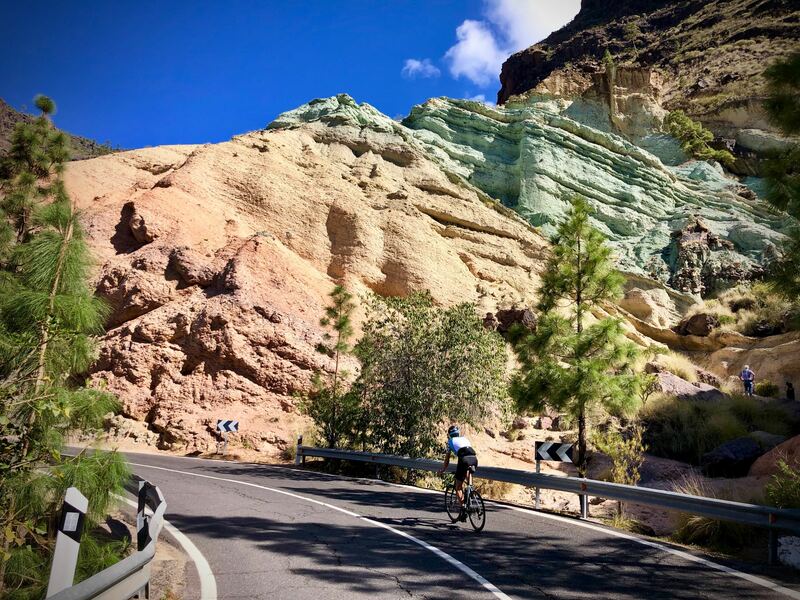 As you may be familiar with already, Gran Canaria is without debate the best place to ride from November to April. The weather is warm and stable with an average of 20 degrees. But as on the rest of the globe there are also days less than perfect. This was one of those days. The wind on the east coast normally comes hard from the north and makes it less interesting to ride that way. This time there was no wind. We met up at 9 in the morning and our only plan was a great day on the bike. That includes full bottles, full pocket of food and a rain jacket (just in case). Since the wind was "gone" we headed towards Las Palmas. The idea was to get somewhat further north and then climb into the mountains. After two hours on the flat we found ourselves around Telde. We looked up into the mountains, and it had just gotten darker and darker. Reminded more of Mordor from Lord of the Rings than our beloved Gran Canaria. Who wants Mordor, rain and cold then? Me: "You know what... why don't we just stay low and go around the island?" - Mike: "Why not. I've never done it before!" :) That's what we call impulsive. Great flexibility and so fun when you can just make it up as you ride along. Since the island loop is a long one, it's about keeping the stops short and ride consistent and conservative. Fueling strategy and pacing becomes more and more important the longer the distance. We stopped just outside Las Palmas and got some baguettes with banana, topped up our bottles and continued on the north coast. After the winding breathtaking coast road we rode the new tunnel and ended up in La Aldea. A local banana plantation "capital". We stopped for the second time, reloaded and prepared for the two remaining big climbs. 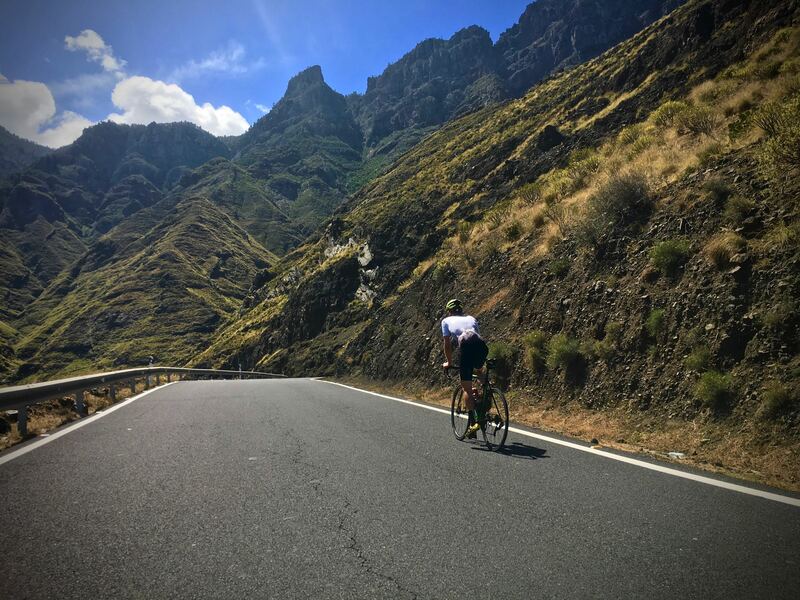 Those climbs over Tasarte and Montaña de Tauro are the reason most choose to do the island loop the other way. But the wind took us the other way today. We knew they were coming and had some left in the legs to handle them. They are still steep, but consistency is king. Towards the top of the first one we got a drop in temperature and went into the black clouds that had been threatening us the whole day. We had no choice but to power through and got a free short shower. But that didn't bother us much since we were mentally prepared for some rain today and it was going up anyway. Perfectly timed it was just a short one, so when we hit the top of the climb we found ourself on dry tarmac once again. Jackets off and descending into Mogán valley. Serenity was the final climb of the day, but this time the clouds kept away from us. Could not get much more out of this day than we did. Almost no rain, 8 hours and a great day with plenty of new memories. But best of all - someone to share it with. Check out the ride on Strava here. As I mentioned initially, we had a lot of other great rides the last week. But this was just so good I had to write about it. 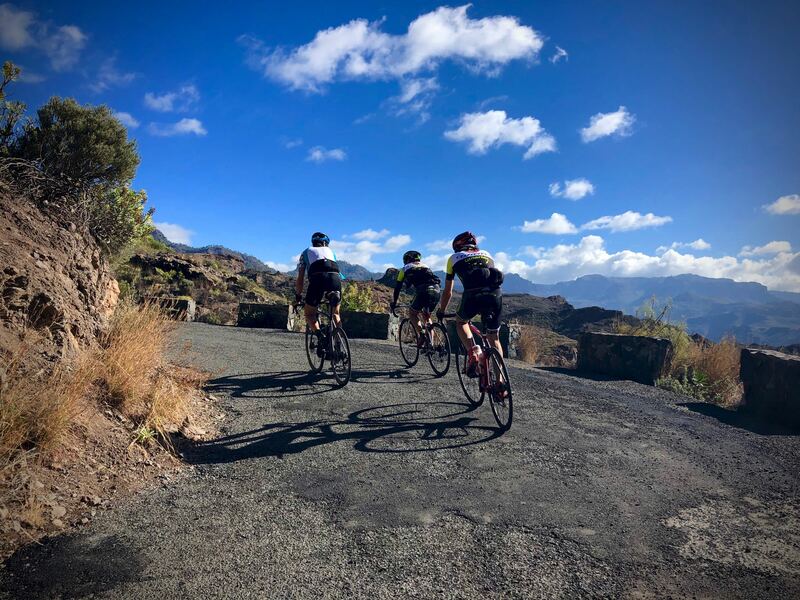 If you also want to take part in some amazing bike rides, we recommend you to check out our services. For something personal, then the Private Ride is the one to go for. Have fun on the bike, stay safe and hope to see you soon!